Today is another good day. 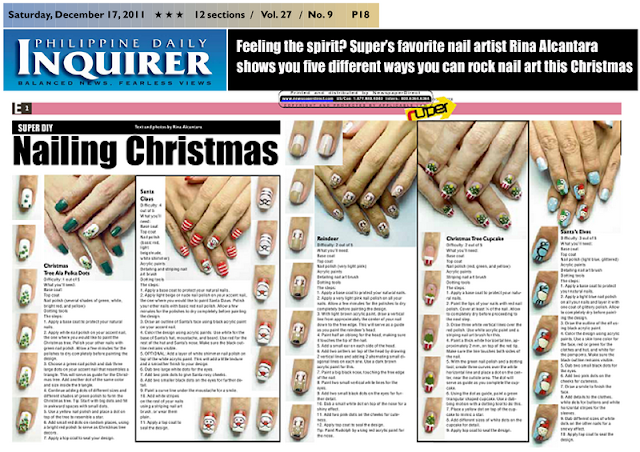 Five of my recent Christmas nail art designs were published in today's issue of The Philippine Daily Inquirer under the Lifestyle section. This is my second time to have contributed nail art tutorials for them and I love the experience. It's a great opportunity to reach out to more nail art enthusiasts and hopefully inspire them to embrace nail painting. Taken from the digital copy of the newspaper issue. 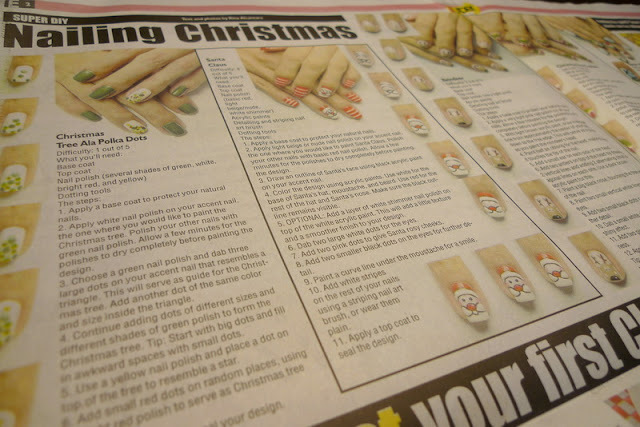 The feeling of having my work printed in a national newspaper is priceless. It still feels surreal. Corny as it may sound, I really want to inspire those who love nail art and would like to learn how to create them. On the side, I also want people to look at nail art from a different perspective, that decorating nails is more than just nail vanity. Opportunities like this being published is a great channel for me to achieve my goals. And so, I sincerely thank Inquirer for having considered me for this project. Taken from the actual newspaper. Nanay (English: mother) bought a copy of the newspaper issue the moment she woke up ... took a photo of the article ... and posted it on Facebook way before I woke up! Thanks to a very supportive mom. My friend Ralph sent me a private message in Facebook really early in the morning, asking if the feature was in the December 16 issue of Inquirer. You see, we were all together with our friends for coffee earlier this week and I told them my nail art tutorials will be on the newspaper on the 16th. But it didn't come out til today. To my friend, here's to letting you know how much I appreciated your sweetness. For online reading, you can find the article here with very limited pictures. Greetings & Congrats from Jax Florida Rins!!! I am wearing the Reindeer right now!! I did nail art at an event for wives/daughters of deployed soldiers and your Reindeer and Santa were hugely popular!! Your nail art is my absolute favorite!!! I send you big and virtual hugs and kisses! !